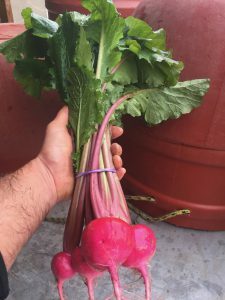 Red Turnips make a bold appearance this second to last week of the csa. When I say turnips many of you tune out but wait… These are the close relatives of the white salad turnips we have had the past couple weeks. Smooth and creamy they lend themselves to eating raw (we like to slice them thinly and bathe in vinegar for round the clock nibbling). Don’t pass up the greens either. Feeling southern? Coarsly chop and stew with onions and a touch of butter and all you need to add is the barbecue. Lots of other good stuff coming too don’t miss the last pickup…bring a box.